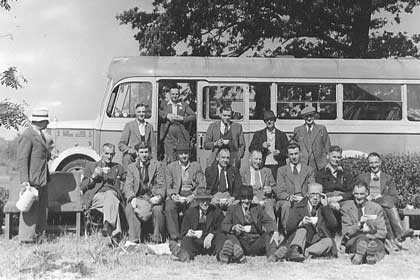 Reg Foggin can be seen seated in the centre row, third from the right. Next to him on the right are Eric Barton and Arthur Schofield. Does anyone know where this photograph was taken? To be fair, Mrs. Foggin did get away from the bairns occasionally. However, the ladies, of course, followed more cultural pursuits! 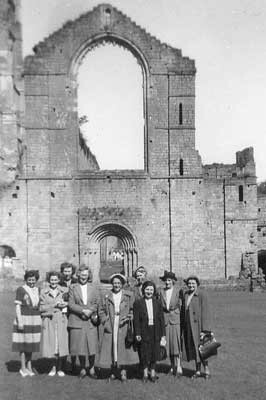 In 1947, the Bishopthorpe Mother’s Union enjoyed a trip to Fountains Abbey. Mrs. Foggin is standing on the left in the striped skirt. 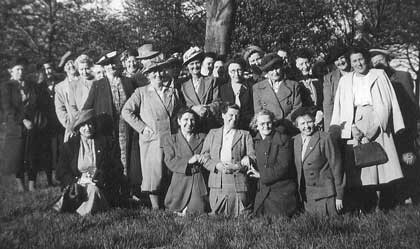 Sporting their Sunday-best outfits, the Mother’s Union visited Ripon in 1952. Mrs. Lily Foggin is kneeling in the centre, front row, with Beatrice Fountain and Elsie Cox. Standing behind in a white suit and clutching a smart bag, is Mrs. Irene Thackrah. They all seem to be relishing their precious day of fresh air and fun! Can you provide more information about these photographs? Just add a comment below.